Traditions help to define an institution and its community from generation to generation. For over 120 years, St. Aloysius Academy has developed traditions that are near and dear to the heart of students, families and alumni. 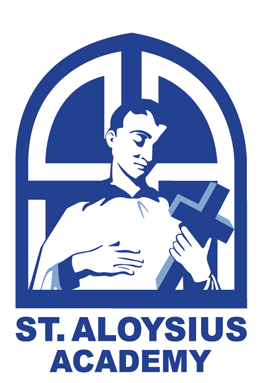 The following events and activities highlight the vibrant legacy of the St. Aloysius Academy experience. Students are treated to a barbeque outdoor lunch and play time during the first week of school in September. It is a great way to celebrate the start of the new academic year in Wildcat Nation. Running in tandem with the NCAA Tournament, 6th-8th graders compete in a single elimination basketball tournament. On the day of the Final Four, 2nd graders put on a dunking exhibition. This fundraiser is a winter highlight and often includes a school-wide outreach. As Catholic School Week begins, St. Aloysius Academy joins with our sister school, the Villa Maria Academy community, for Mass and a social to celebrate our common heritage of the IHM Charism of love, creative hope and fidelity. This event takes place in Sacred Heart Chapel at the IHM Sisters Motherhouse in Immaculata, PA.
St. Aloysius Academy dads and sons gather to celebrate the special bond of father and son. After Mass is celebrated, guests enjoy a guest speaker and a delicious buffet breakfast. St. Aloysius Academy shares a special relationship with St. Gabriel Parish, a parish in South Philadelphia staffed with IHM Sisters. Older students partner with younger students to prepare fresh meals that are then frozen and delivered to the parish for people in need. St. Aloysius Academy is grateful to families who help with food preparation. Families can also take home trays to fill and freeze, and collections are made monthly. The GALA is a very special evening for all in attendance. Sponsored by the Parent Association, it is the major fundraising event of the year and is held each spring. The event features exciting live auctions, cocktails, dinner and dancing. Students welcome their grandparents and others that are close to their hearts for a bite to eat and a glimpse into what they are learning. Each October, staff and students participate in a spirited pep rally in anticipation of Homecoming Saturday. Students, families, alumni and friends gather to celebrate the St. Aloysius Academy community and its camaraderie. Attendees cheer on our soccer and football teams at this all-day event. Faculty and students celebrate the founding of the IHM Sisters on November 10th. Reverend Louis Gillet, Mother Teresa Maxis and the first Sisters began the IHM story on November 10, 1845 in Monroe, Michigan. To commemorate the birth of Jesus, students play the roles of Mary, Joseph, and the shepherds in Gonzaga Courtyard. Choir members, live animals, hot chocolate and luminaries enhance this beautiful night. 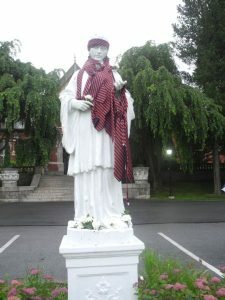 In the tradition of St. Aloysius Gonzaga, St. Aloysius Academy’s patron, 7th and 8th grade students participate in a passing on of school leadership called the Magis, a Jesuit term meaning “above and beyond.” All students embrace “being a man for others.” Grade 7 students receive the symbols of leadership in a prayerful setting. The PAWS program permeates the halls of the St. Aloysius Academy. Every morning students recite the PAWS pledge, promising “to recognize and enjoy each other’s differences and talents and to seek out the good qualities in my fellow students with whom I work study, play and pray.” The PAWS pin is worn on the students’ lapels as a constant reminder of the pledge. Each month, PAWS Leaders are acknowledged publicly. These students promote the Magis and have assumed the role of Christian leadership and service in the tradition of the IHM charism of love, creative hope and fidelity. In honor of Mary, our Mother, all students proceed to the grotto of Mary and Bernadette while reciting the decades of the rosary during the month of October. Second grade students prepare to receive the Sacrament of Reconciliation in the spring and third grade students prepare to receive First Holy Communion around Thanksgiving. These special events take place at the IHM Conference Center’s chapel. Sixth grade students receive sacramental instruction at St. Aloysius Academy for their Confirmation at their parish.